The Bays Precinct, Central to Eveleigh and similar large scale urban renewal projects are seen as helping define Sydney as a Global City. Michael Darcy explores the relationship between a Global City and its citizens. It must be abundantly clear to anyone living in or even visiting Sydney in 2014 that our city is in the midst of a massive transformation. Even as the skyline rises around us we are presented with new and grander plans for rebuilding housing, infrastructure and public space right across the city. For those of us who call the inner city home this is a disruptive and possibly frightening process which sometimes appears to be out of control, and potentially threatens our sense of place and security, our community and even our dwellings. At the same time, we all love and benefit from the dynamism and energy of Sydney. Cities are the source and the engine of not just economic growth and wealth creation, but of society and culture, science and knowledge creation. Living cities cannot be frozen in time; Sydney has been remade many times over since European colonists arrived 226 years ago and this is not about to stop. From the days of transportation, through the gold rush, the world wars and waves of refugees, the city’s growth path has always largely been determined by international pressures and events rather than the preferences of locals. But it is true, the pace and scale of change is accelerating and the forces driving it are increasingly seen as global ones. Sydney grew up as a port and later as a manufacturing centre – it was the hub and the fulcrum of Australia’s participation in global production and trade. Today minerals and other commodities are shipped directly to manufacturers in China and other parts of the world through dedicated ports often in remote places. While miners fly in and out of company towns, Sydney provides the site through which production is financed and coordinated rather than where it actually takes place. 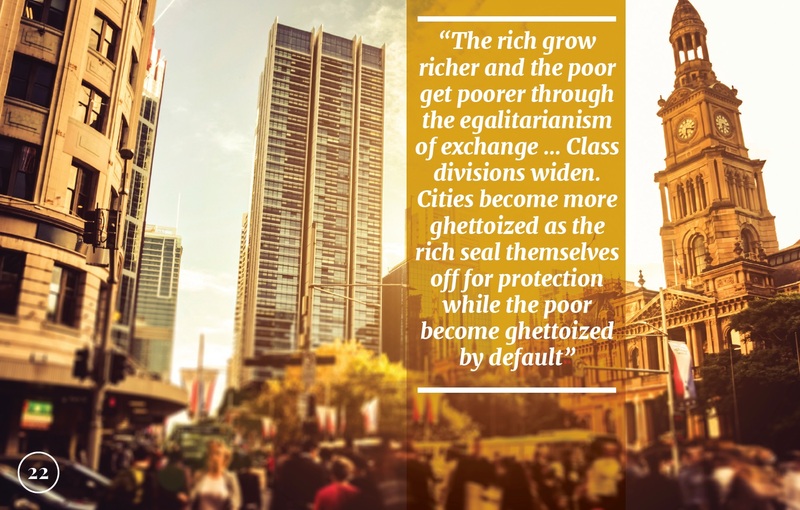 So the city provides a home for an expanding global middle class of managers and technocrats who choose to live in the city, not so much for its productive capacity as for the opportunities it provides for consumption. This global middle class want harbour views, high quality public spaces and great coffee – and they are prepared to pay for it! And therein lays the problem. How can the demands of people with money to spend, and a preference for particular locations and lifestyle, be reconciled with the needs of the existing populace, many of whom built and worked in the ports, factories and other businesses that made the city what it is, and many more who continue to provide the services and infrastructure that keep it going? In a market economy with limited available land and diminishing support for the public sector, will pensioners and lower paid workers be driven out of the city? What kind of city will Sydney be? The people I speak to at community meetings, in the supermarket or the pub, usually, and very astutely, distil these big questions down to three very practical concerns: the cost of housing, the strain on infrastructure and public services, and access to public space. Behind these concerns lies a lack of faith in the power of democratic processes to properly reflect the interests of residents and control powerful profit driven investors with little or no ongoing accountability for urban outcomes. “The rich grow richer and the poor get poorer through the egalitarianism of exchange. No wonder those of wealth and power support such rights. Class divisions widen. Cities become more ghettoized as the rich seal themselves off for protection while the poor become ghettoized by default”. Harvey is neither a revolutionary nor a utopian planner. He recognises that there is no perfect or correct way to build a city or to resolve urban conflict. In a capitalist society property rights dominate, but citizens must demand a new kind of right to the city, an active right to make the city different. So how should we think about government and developer plans for vast redevelopment of our built environment and the changes they will inevitably bring to the makeup of urban communities – more importantly, how should we act in response? Many argue that publicly owned land such as Central-2-Eveleigh and The Bays should be kept in public ownership. People have a right to be cynical following the abrogation of transparent planning processes seen at Barangaroo. The sale of public housing in Millers Point is another good reason to be sceptical about government’s understanding of the housing needs and community life of older people and poorer households. But despite the bitter experience, I believe we still can and should see development and urban change as an opportunity to get things right, and to show Australia and the world that dynamic, vital cities can also be just, inclusive and sustainable. Given the seismic changes in the world economy it is not surprising that obsolescent industrial sites should be identified for redevelopment, or that well serviced inner city locations would be attractive to cashed-up international investors and buyers. The fact that so many of these remain, for the moment, in public ownership opens the door to capturing a proportion of this new value and redirecting it to create diverse and inclusive communities. Many international examples, and our own experience, show that highly mobile and educated buyers seek out inner city locations not just for views and restaurants but for the diversity, colour and street culture that can’t be found in the suburbs. Land must be reserved in large development sites for social and affordable housing and mandated developer contributions can be used to fund ongoing management costs. Density is a divisive issue, but it must be recognised that higher densities across Sydney are not only required to reduce energy use and transport demand, but the evidence shows that well designed density leads to healthier, more walkable, and better serviced neighbourhoods. Households are far smaller, and more people live alone than ever before. The housing market already shows a growing preference for smaller and better located dwellings. This demand can be the catalyst for better public transport and neighbourhood services which will benefit all. Good design with an emphasis on quality public spaces is the key to realising the benefits of increased density but this will put pressure on developer margins, so an inclusive and transparent planning process is more important than ever. “If our urban world has been imagined and made then it can be re-imagined and re-made. The inalienable right to the city is worth fighting for”.